Jeffrey Yoskowitz, cofounder of The Gefilteria, trained as a pickler at Adamah Farm, where he fell in love with the art of lacto-fermentation, and has worked in the food world as an entrepreneur and a consultant for food businesses, as well as a writer. He grew up visiting New York’s finest Jewish food institutions and has written on food and culture for The New York Times, The Atlantic, Slate, and Gastronomica. He frequently speaks to audiences around the world and teaches workshops about Jewish food and culture. 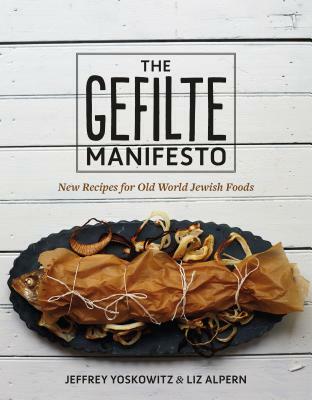 Liz Alpern, cofounder of The Gefilteria, , got her start in the Jewish food world working with acclaimed cookbook author Joan Nathan. She curates and cooks for pop-up events and gives lectures and hands-on classes around the globe about Jewish food and culture. She holds an MBA from the Zicklin School of Business at CUNY Baruch College. She has been featured in Forbes’ 30 Under 30 list for food and wine, as well as in The New Yorker, The New York Times, Saveur, and The Wall Street Journal.